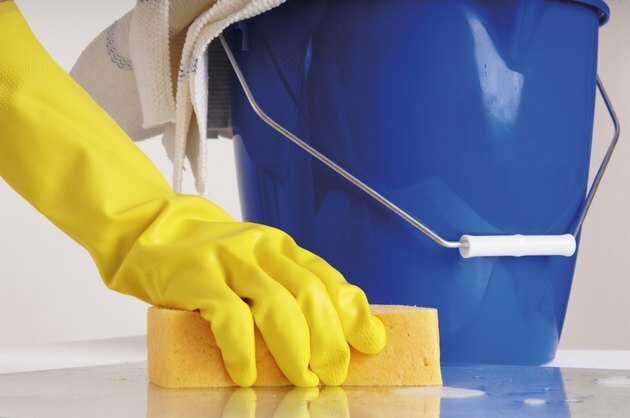 What Is the Vinegar-to-Water Ratio for Cleaning? Vinegar is a pantry staple ideal for sprinkling on salads or using in marinades. But this distilled corn-based product is also very useful as a cleaning agent. Used for generations as the main household cleaning product, vinegar was replaced with commercial cleaning sprays. But many families are returning to a more natural approach to cleaning. Mixing vinegar with water in a variety of ratios is a safe, environmentally friendly way to clean up many areas in the home. Vinegar comes from the alcohol produced by corn, which is fermented until it reaches full-strength. Then it's diluted with water to a 5 percent acidity level. It's this acetic acid level that gives vinegar its cleaning power. It's thought to have some antimicrobial properties to get rid of some bacteria around the home. It's an environmentally safe product and non-toxic. However, vinegar does leave behind an intense aroma. The vinegar smell disappears in a short time, leaving your home clean and protected by this natural disinfectant. Household vinegar has a 5 percent acidity level. Cleaning vinegar, a newer product on the market, is 6 percent acid, and more costly. The less-expensive 5 percent is just as effective as a cleaner. Some jobs around the house call for straight vinegar. Cleanse the walls of your shower with full-strength vinegar to get rid of all the gunk. Pour vinegar down drains to clean them and the pipes they connect to. Let the vinegar sit for 30 minutes; then flush with cold water. To clean your dishwasher, pour 1/2 cup of undiluted vinegar into the soap dispenser and run a cycle. Vinegar is also recommended for cleaning wooden chopping blocks. It may help get rid of some of the bacteria left from cutting raw meat. Your coffeemaker needs a good cleaning every few months, and using a vinegar solution in an equal ratio of vinegar to water makes an effective cleanser. Pour a specified amount of vinegar into the water holder and add an equal amount of water. Turn on the coffeemaker and let it run halfway through the cycle before turning it off. Let the solution sit for about an hour; then complete the cycle. Rinse the machine several times with clean water. This equal-ratio method also works to clean steam irons and steam cleaners of the minerals left behind after using non-distilled water. Just a little vinegar added to water helps you tackle everyday cleaning jobs. One tablespoon of vinegar mixed with 16 ounces of water cleans the interior of your refrigerator. Spray it on a microfiber cloth and wipe it on your stainless steel appliances to make them sparkle again. To cut the grease and clean solid floors without leaving behind a sticky residue, use 1/4-cup vinegar in a bucket of warm water. Mop the floors and let them dry. Do not use vinegar on wood floors, unless they're highly sealed, or marble. If possible, open the windows until the vinegar smell dissipates. Another 1/4 cup of vinegar poured down a disposal and left to sit for about 15 minutes makes it smell fresh and clean. Or make vinegar ice cubes by pouring vinegar into the sections of an ice-cube tray. Churn the ice cubes in the garbage disposal for a weekly cleansing. Be sure to label the cubes so you don't ruin your cold drinks. A cup of vinegar added to rinse water leaves glassware shiny, spotless and squeaky clean. To clean windows, mix 1/4-cup vinegar with 2 cups of water and spray. Wipe with newspapers or a squeegee. Exterior aquarium glass can exhibit calcium build-up. It is easily removed by mixing 1/2 cup of vinegar with 1/2 gallon of distilled water. Spray a bit of the dedicated aquarium cleaner on a cloth and wipe the rim and top of the aquarium as well, removing the deposits as you wipe. If a bit of the vinegar solutions enters the water it won't affect the fish as the acid is neutralized in the aquarium water. Vinegar uses go way beyond cooking. Mix up different ratios of vinegar and water to clean up all sorts of surfaces in your home, from stainless steel appliances to windows. Will Vinegar Ruin the Rubber Seals on Appliances?